One day, I filled 2 Crock Pots. The night before, I had soaked a bowl of pinto beans and I divided them between the 2 pots. In one, I made chili. 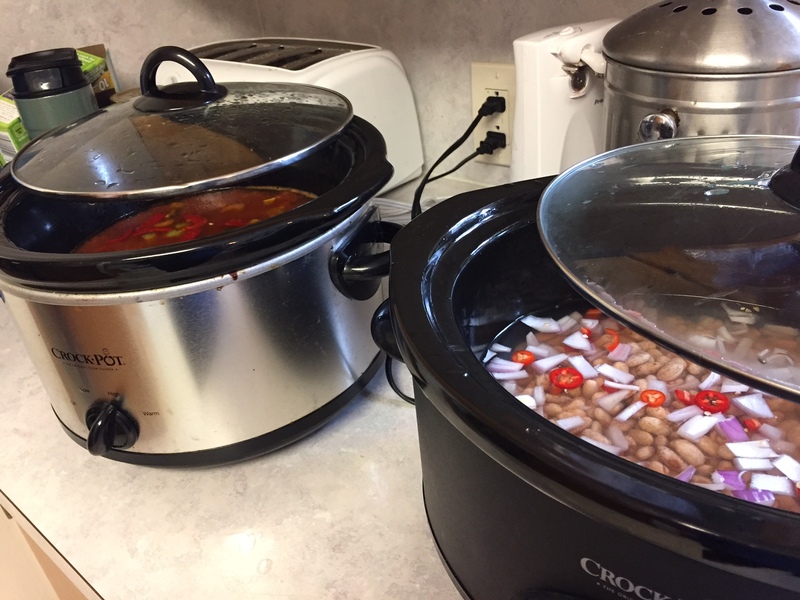 Along with the beans, I used hamburger, celery, peppers from the garden, canned tomatoes, water, onions, 1 pint beef broth, and chili powder, salt and pepper. In the other pot, I put beans, water, onions, peppers, salt and pepper to make refried beans. I cooked both pots all day. In the evening, we ate chili for dinner with cheese and onions on top, along with cornbread. The beans were pureed and frozen for Family Sunday Dinner. They were a little thin, so I did cook them down some more until they thickened. I will make more soon, as the kids love them so much. I pulled 2 packages of pork chops out of the freezer. They had been in there for quite a while, and I’m targeting older items. I made an apple sauce with apples, dried cranberries, green onion and apple juice. 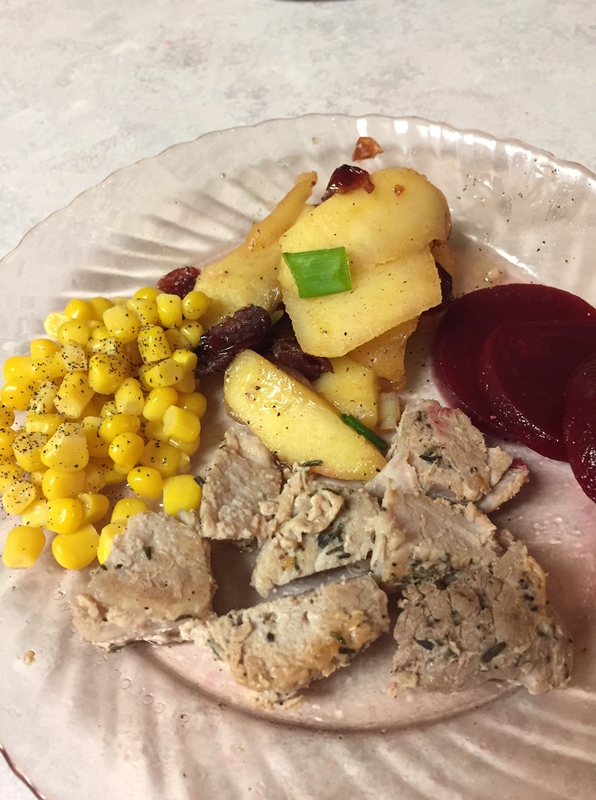 It was a recipe I found in a gluten-free cookbook, and it was marvelous with the pork. I opened 1 can of corn and 1 can of pickled beets Rob had found for so inexpensively a while back and we had 2 or 3 meals out of that combination. I made quite a bit of white rice last week, and we have had it several times this week. Wednesday, Rob made Teriyaki chicken, rice and green salad. I marinated the chicken in the fridge, the rice was pre-cooked and he just had to cook the chicken, warm the rice, and toss the salad, while I was away at an appointment with one of the children. I did a large pot of chicken noodle soup today. I just made it very simply–frozen broth and frozen chicken from a couple of weeks ago, 1 carrot, 1 stalk celery, 1 onion, some poultry seasoning, salt, pepper and gluten-free egg noodles. We had it tonight, and it was great. Alissa made broccoli soup for Wednesday lunch and used broccoli from the garden. Those 5 bushes are still sending out some side shoots every few days. It was very strong when it was so hot, but with all this rain, it’s very mild and tasty again. Ja’Ana made another batch of cornbread, her second this week. She really likes cornbread, as we all do, because we’ve eaten 2 batches almost all the way up! 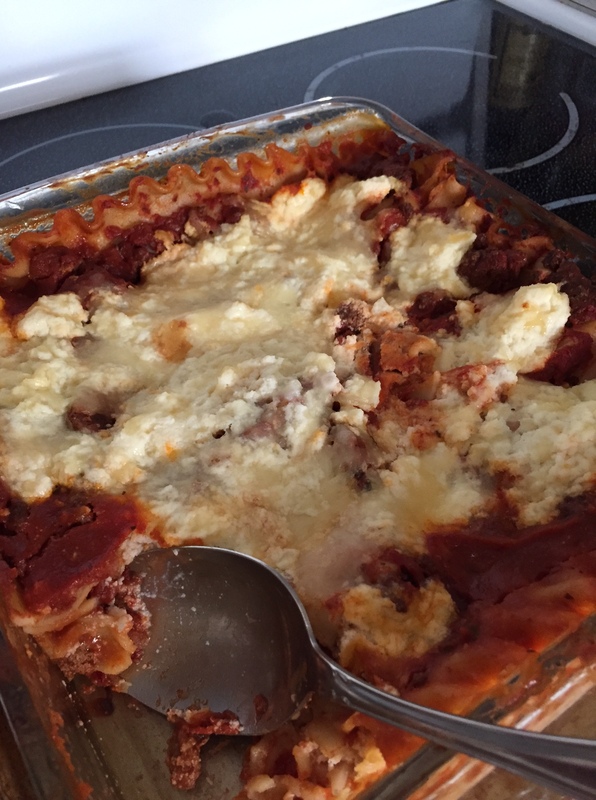 I finally got the lasagna made, and it is almost all gone! There was extra filling left and I froze it for another day. There are just a few odds and ends of most leftovers left for tomorrow, and a lot of soup. I hope to cook a few items tomorrow for next week. We had oatmeal, eggs, pancakes, cereal and fruit for breakfasts. We had these meals for dinners and lunches during the week. We made a lot of caramel corn and ate it for snacks, along with some krispie treats. I did do some grocery shopping at last, and spent about $75. I got my big box of coffee for $20 for 80 coffee pods. That makes them 25c each and that is a good price for those. The rest was for things like the butter, dairy products, a head of lettuce, celery, drinks for Rob’s lunch, odds and ends, etc. I still need to do a small Costco run, and will need milk again soon, even though my sister gave me an extra gallon she had. You just never know around here. We can go for an entire week on 1 gallon of milk, then go through 2-3 the next week. Happy eating at your house! Everything looks so good! I picked up the stuff to make lasagna for either this week or next week. Right now it isn’t on my menu plan, but I’ve been known to change to suit my mood LOL. However, my ingredients are dated far enough out I will be fine if I wait a week. Butter is selling for $3.99/lb. for store brand, here. I had a $.50 off coupon, but even with that, it would have been $3.49, so I didn’t buy any. I still have 3 lbs. in the freezer, so I’ll hold off and see if it comes down a bit more. I’ll be happy if it comes down to $2.50, but, I’m afraid $3 might be the new “sale” price! I always love looking at your posts and the yummy things you make and the fun things you do. I guess sometimes it just gives me good ideas when I see what other people do. I hope you are feeling better than you were!! Your food always looks so yummy! We had cornbread twice here, too. I make a tiny skillet for the two of us and the leftover goes into a Ziploc in the freezer for another day. I have ricotta and good intentions for lasagna and I too feel like it is a project. I love having it and then freezing squares for later so I just need to get to it. I guess it’s cornbread season all over!! I like freezing things, too.